Oliver Whitehead from Helsinki, who recently showed his work in a retrospective at Cartes Flux Festival in Espoo/Helsinki, comes to Berlin to show his work at Z-Bar. Oliver Whitehead has explored a wide range of fields within arts, such as drawing, painting, photography, computer imaging, film, video, installation, and sound stretching their expressive possibilities, and without respecting boundaries. He thus may be called a ³true media artist². In his early film work, he was influenced by the uprising Film-Coop movement in England and the French Nouvelle Vague. He however stopped making films when coming to Helsinki in 1970, where he since has worked as artist, and partly at Kuva Academy, the Academy of Fine Arts in Helsinki. In 1991, he has picked up with film and video again, now exploring his personal and built surrounding in most unorthodox ways. In most recent years, film and video have become a main focus in his work. As in "bike", where the camera travels along the shore of the city of Helsinki, his film work mostly evolves from captured impressions. Here, he depicts glances on people, traffic and architecture, edited in an Allegretto rhythm of movements. The film thus reflects the intrinsic meanings of a different but daily perception of urban life and the built surrounding. In "visual violence", a camera travels through contemporary interior public spaces and, as in other films, the captured immediate impressions tell about sensations, which are both political in their direct relationship to the body, and metaphorical in the ways they become examples of a 'bigger picture' of meanings in the world. The films thus are less part of a simulacrum made by the media but they are reflections on visual and media perceptions, and the ways our contemporary and vernacular surrounding can be read in meaningful ways. 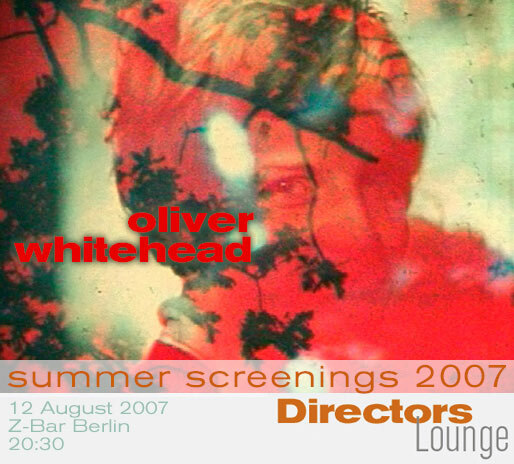 With two films, Oliver Whitehead was already part of this year's Directours Lounge and some further Urban Research screenings. Now, we are proud to be able to give a more deep insight in his film and video work, and have the artist present his work at Z-Bar. The screening will be the opening of further summer screenings of Directors Lounge in August and September 2007.